Lethal voltages are present in the circuits described in this article. Appropriate precautions must be taken to prevent injury or death from electric shock. Construction of the circuits described in this article are not recommended for individuals without appropriate training and experience regarding the construction and use of high voltage circuits. Arthur Harrison assumes no liability for any damages, direct, or consequential, which may arise from the dissemination, application, or misapplication of the content contained in this article. The User of the information provided in this article assumes all responsibility for any damages, direct or consequential, which may arise from its use. Arthur Harrison retains the right to alter the content within this site at any time without notice. In the early 1930s, the first commercially-produced theremin, known as the model AR-1264, was manufactured in the United States with the brand of Radio-Victor Corporation of America (RCA). Approximately 500 of the instruments were manufactured for RCA under contract by General Electric Company and Westinghouse Electric and Manufacturing Company. While few remaining instruments have survived intact into the new century, they are eagerly-sought collectors' items, favored by some theremin enthusiasts for both their distinctive timbre and antiquity. A widespread desire to emulate the sound and response of these instruments, using modern circuit techniques, has induced me to provide new schematics, based on the original "RCA Theremin Service Notes" published in November, 1929. The new schematics represent a welcome improvement over the original drawings, which are extremely difficult to analyse due to their awkward, convoluted appearance. These schematics should be useful to modern theremin designers and constructors in their analysis of the AR-1264. Hopefully, modern equivalents of the design will emerge, using thermionic, as well as solid-state technology. In addition, the new, clearer representation of the design will aid in maintaining the surviving instruments. The new schematics are designed to assist circuit analysis. However, they do not indicate the physical locations of components, for which the original Service Notes [Reference 1] should be consulted. The original schematics incorporate reference designations for vacuum tubes "V1" through "V7" in the pitch and volume circuits, which are retained in the new schematics. I have added designations for all the other components, including the rectifier tube, which I have labeled "V8." The original Service Notes schematic, page 8, erroneously interchanged the designations of vacuum tubes V6 and V7, as indicated in red. The original documentation omits values for several components, including all the frequency-determining inductors, transformers, and capacitors. Many of these values, however, have come to light in later references. T5 Output Audio Part of the RCA Victor Company 106 Loudspeaker unit. 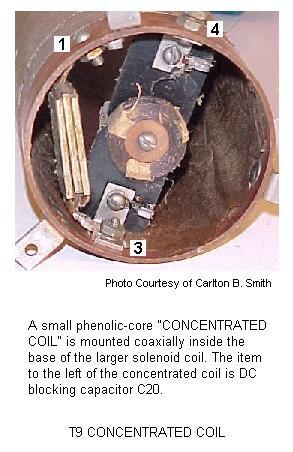 Concentrated coil: phenolic form, lattice wound. DCR (DC resistance) obtained from RCA_Service_Notes [Reference 1]. Current rating determined by requirement of 2 amperes for V8 filament [Reference 4]. Current rating determined by requirement of 83 milliamperes through R4 and R5, and 250 milliamperes through each of the V6 and V7 filaments [Reference 4]. Current rating determined by requirement of 7 amperes for V1, V2, V3, and V4 heaters and approximately 150 milliamperes for the pilot lamp [Reference 4]. [Reference 7]. The values presented in the table are rounded from Mark McKeown's measured data. The magnet wire originally used for the coils, with both enamel and silk covering, is no longer manufactured. The single-build polyesterimide-insulated copper magnet wire specified in the drawings is a modern substitute. A caveat in the above derivation, however, is that the mutual inductance for the T6 and T8 windings, also a frequency-determinant, is unknown. Distributed capacitance in the transformer windings is also not considered. Regardless, the result of 198.3kHz is sufficiently close to the value of 175 kilohertz indicated in the Service Notes. This provides a good degree of confidence that the calculated value of inductance and recommended capacitance values for C16, C18, and C19 are reasonable. 85 1.75"-diameter turns of number 30 wire yield a DC resistance of 4.04 ohms (pi X 1.75" X 85 X .00864 ohms/inch). This value is larger than the 2.5 ohms described in the original document. However, this deviation may easily result from variations in material properties or measurement error. This value is remarkably close to the 30 millihenry value given in reference 3. The deviation may be due to a number of factors, including the actual coil length, which may be somewhat longer than the 0.267 meters used for the calculation due to wire thickness variations. Although T9 may be considered two coils in series, the smaller "concentrated coil" is mounted coaxially within the base of the larger solenoid coil, within its electromagnetic field. Therefore, I have indicated the pair as a transformer. This rational is substantiated in the Service Notes state one of the causes of a reduced pitch range being reversal of the concentrated coil connections. Reference 3 suggests T9's value as 20 millihenrys, a reasonable estimate based on the physical appearance of the coil, but not verified. Mark McKeown [Reference 7] measured the concentrated coil in an AR-1264 as 11.4 millihenrys, and the DC resistance as 96 ohms, making the J.W. Miller type 670T a likely candidate. In practice, the parameters of T9's coils are best determined empirically, by constructing trial units, subjecting them to measurements, and adjusting them for the desired resonance of 172 kilohertz. The power supply is a full-wave, center-tapped transformer design, using V8 for rectification, and a three-section L-C filter (L1-C1, L2-C2, and L3-C3), to reduce 120Hz ripple. Further filtering and decoupling is provided with R1, R2, C4, and C5 for "B+2," used for the volume circuit. One peculiarity lies in the parallel combination of the 2250 ohm and 14.3k ohm resistors (R1 and R2), in that a single resistor could have been used. My speculation is that the power supply may have been an adaptation of a unit originally intended for another design. This suspicion is reinforced by the fact that two pairs of the power supply output terminals are redundant, with only one of each pair being connected to the other chassis. Also, two capacitors are physically present, but not used (refer to the original power supply schematic). 20k ohm resistor R3 is probably a safety bleeder to discharge the power supply capacitors with power off. According to Mark McKeown, the power supply is exactly the same as the one used in the RCA "Radiola 60" radio, released in 1928 [Reference 7]. The design of the instrument pre-dates the availability of high-value electrolytic filter capacitors, so large inductors (L1, L2, L3) were used in combination with 2 microfarad and 0.5 microfarad non-polarized capacitors to achieve sufficient AC ripple reduction. This is probably fortunate, since the non-polarized capacitors tend to have a longer life than the more modern electrolytic types. 30 ohm resistors R7 and R8 establish V1, V2, V3, and V4's 2.5 volt heaters at ground potential, with the tapped arrangement a common practice to reduce 60 hertz "hum" in the circuits. These resistors are large wirewound types, probably used for their relative precision rather than power-handling capability, since their dissipation is nominal. The values for these resistors were not in the original schematic, but were determined from the "Continuity Test" tables in the Service Notes Reference 1]. A similar scheme, with 30 ohm resistors R4 and R5, is used for the 5 volt filaments of directly-heated tubes V6 and V7. 550 ohm R6 provides cathode bias. The amount of bias is selected for operating the output tube, V7, at about 30 milliamperes. The same bias, appearing at volume oscillator V6 is not critical, as long as sufficient oscillation occurs. C6 is the AC bypass capacitor for V6 and V7 [Reference 9]. The inductance values for inductors L1, L2 and L3 are not given, although their sum DC resistance is 1000 ohms, per the Service Notes [Reference 1]. Note that there is no fuse, however, two safety interlocks, S2 and S3, are provided to shut off the power when the doors of the instrument are open. The volume oscillator is a resonant-feedback "Armstrong" type using a directly-heated triode, V6. The specified oscillation frequency is about 420 kilohertz, primarily determined by the two plate-to-grid capacitors C11 and C12, the 55pF variable capacitor C10, and the inductance of the transformer T2 (right-side coil), and the loading effects of T3. Variable capacitor C10 is a front panel control ("Volume") that facilitates the user's adjustment of the volume response. C10's range is calibrated with C11, mounted on the rear wall of the instrument's main chassis. T3's primary winding is provided with a 420kHz waveform, via capacitor C8, obtained from V6's grid. The circuit path for T3's primary is completed through the capacitance between the volume antenna, space, and ground. This capacitance is altered by the hand's position, and is therefore referred to as the "hand capacitance." T3's primary-winding resonant frequency is determined by its inductance, self capacitance, and the hand capacitance. The self-capacitance of T3's primary is minimized by its one-layered, solenoid-style construction, thus making the hand capacitance a significant factor in determining its resonance value. With the hand away from the antenna, the hand capacitance is at its minimum. Under these conditions, the voltage reflected in T3's secondary winding is sufficient to cause V5's filament to glow. As the hand approaches the antenna, the resonant frequency of T3's primary decreases, moving further away from the oscillator's frequency. As a result, the voltage across T3's primary decreases. T3's secondary voltage, in turn, diminishes. With the hand closest to the antenna, V5's filament dims. V5, therefore, acts as a variable current source that is controlled by its filament temperature. V5 supplies plate current to triode V4. V4's grid is fed the audible signal from the theremin's mixer via transformer T7. Variations in current supplied to V4 by V5 correspondingly vary the audio-signal amplitude at V4's plate. The amplitude-controlled audible signal is coupled, via T4, to audio output triode V7. With the hand away from the volume antenna, V5's filament is hottest, providing maximum conduction in V5, and therefore maximum current, to V4. In this condition, the greatest audio-signal amplitude appears at V7's plate. Conversely, with the hand close to the volume antenna, V5's filament is coldest, providing minimum conduction in V5, and therefore minimum current to V4. In this condition, V4 has no plate bias, so no audio-signal amplitude appears at V7's plate. Resistor R12 provides a DC path for V5. It is returned to a negative bias voltage furnished by the V6 oscillator, via voltage divider R10 and R11. This negative bias ensures that V4 will be completely cut off when the hand is closest to the volume antenna, thereby ensuring no audible output. Resistor R9 and capacitor C7 provide further decoupling of the B+2 supply for the volume circuit. Capacitor C8 blocks B+ voltage from the volume antenna. Although the value of C8 can not be determined from the original documentation, photographs show that it is substantially identical in shape and size to C20 in the pitch section, and so has been marked accordingly in the new schematic. Exact resonance the antenna circuit and T3's primary is avoided to prevent instabilities, and also to prevent excessive voltage in the T3's secondary coil that may damage V5's filament. In addition, operation of T3's primary at resonant values below that of the oscillator's frequency provides a consistent relationship of hand position and volume. The RCA Theremin employs the "heterodyne" process to produce a variable-pitch tone. To achieve this, two Armstrong oscillators provide outputs that are combined in a "mixer" circuit to generate the sum and difference of their frequencies. One of the oscillators, comprised of triode V3 and its associated components, is the "Pitch Reference Oscillator," which produces a nominal output of 173.4kHz. The Pitch Reference Oscillator frequency remains constant regardless of the pitch hand's distance from the antenna. A second oscillator, the "Pitch Variable Oscillator," is comprised of triode V1 and its associated components. The Pitch Variable Oscillator produces frequencies that nominally range from 172 to 173.4kHz, depending upon the distance of the hand from the pitch antenna. As the hand is moved toward the pitch antenna, the capacitance between the hand and the pitch antenna increases, which, in turn, decreases the resonant frequency of the T9 transformer circuit. The self-capacitance of T9's primary is minimized by its one-layered, solenoid-style construction, thus making the hand capacitance a significant factor in determining its resonance frequency. T9 is connected to the Pitch Variable Oscillator. As T9's resonant frequency decreases, the Pitch Variable Oscillator frequency decreases as well. T9's secondary is the "Concentrated Coil," which is a small phenolic-core coil coaxially mounted inside the base of the larger, primary coil. The likely purpose of the concentrated coil is to supplement the inductance of the primary coil, so that their sum inductance, in conjunction with the sum of hand and stray capacitance, provides the desired range of self-resonant frequencies. It is not known if the magnetic coupling or phase relation between the two T9 coils is significant, and therefore, T9 may alternatively be considered two series-connected inductors. Resistor R14 and capacitor C15 provide additional B+ filtering for the two oscillators, and decoupling from the other sections of the circuit. Capacitor C20 provides DC blocking to prevent B+ voltage from being present at the pitch antenna. Resistor R16 reduces the signal amplitude at V2's screen grid so that it is comparable to the signal at its control grid. Resistor R15 provides DC grid bias for V3, and capacitor C17 provides a low impedance shunt path for the AC signal. Resistor R17 and capacitor C21 provide the same functions for V1. With the hand away from the pitch antenna, the Pitch Variable Oscillator is adjusted so that it's frequency is slightly greater than the given resonant frequency (172kHz) of the T9 circuit. Also, with the pitch hand away from the antenna, the Pitch Reference Oscillator is adjusted to provide the same frequency as the Pitch Variable Oscillator. Under these conditions, the audio output will be "0 Hertz," corresponding to no tone, since both pitch oscillators are at the same frequency. As the hand is moved toward the pitch antenna, the resonance of T9 decreases, causing the frequency of of the Pitch Variable Oscillator to decrease. With the hand at the closest practical distance to the pitch antenna (about 1"), the frequency of the Pitch Variable Oscillator decreases approximately 1400Hz. Under this condition, the difference between the Pitch Reference Oscillator and Pitch Variable Oscillator frequencies will be approximately 1400Hz, thus producing a 1400Hz audio tone. Variable capacitor C16 is a front panel control ("Pitch") that facilitates the user's adjustment of the pitch response. C16's range is calibrated with C18, mounted on the rear wall of the instrument's main chassis. The pitch range of the instrument depends on the amount of influence the T9 resonant circuit has on the Pitch Variable Oscillator's frequency. This, in turn, depends on how close T9's resonance is to the oscillator's frequency, with the greatest influence occurring when the two values are closest. Optimally, C22 is adjusted so that the pitch range is 1400Hz. The plate of Mixer V2 drives the primary of transformer T7, the first of three transformers in the audio chain. V2's plate voltage is provided through T7's primary. T7's secondary drives Audio Preamplifier V4's grid. Since V4's cathode is grounded and is therefore unbiased, it is presently speculated that grid current may be drawn during a portion of the AC waveform, therefore causing the addition of certain harmonics to the instrument's timbre. While there are no specific components to remove the high-frequency portion of the heterodyne wave at V7's plate, the bandwidth limitations of T7 presumably serve this purpose. V4's plate drives the primary of transformer T4, with its plate voltage provided by the Volume Modulator section, previously described. T4's secondary drives Audio Power Amplifier V7's grid. The "Play-Off" switch provides a means for muting the instrument, which permits it to be muted by the player without the constant presence of the volume hand. Resistor R13 provides a load for T4's secondary, thus preventing a destructive rise in potential at V4's plate when the switch is in the "Play" position. The direct connection of T4's secondary to V7's grid may, again, introduce harmonics should V7 draw grid current. The possibility of grid currents for V4 and V7 require further investigation either by the direct measurement of an existing instrument, or the evaluation of an equivalent circuit. Lastly, V7's plate provides the signal to the external loudspeaker via output jacks. Capacitor C14 attenuates high-frequency harmonics in the audio wave, and also probably serves to shunt any residual high-frequency, inaudible content to AC ground. The electrical characteristics of the three audio transformers undoubtedly lend certain qualities to the theremin's tone quality. Presently, the only documented specifications for them (DC resistance values) was provided by Mark McKeown [Reference 7]. Given the opportunity, it would be useful to substitute the three transformers with modern types, and observe what variations in timbre might occur. "The RCA theremin - 1"
"The RCA theremin - 2 - The pitch control system"
"The RCA Radiotron Manual Technical Series No. R-10"
"Construction of a Semi-Replica RCA Theremin"